This is our "basic" batwing chap, it is a fully functional working chap. Want to order the easy way? Ordering online can be intimidating and a daunting task for some. I you want, just call us at 208-785-8963 and we will take your order. We will explain and walk through every step with you and make sure everything goes smooth and easy. Otherwise, continue on reading if you wish to order online. 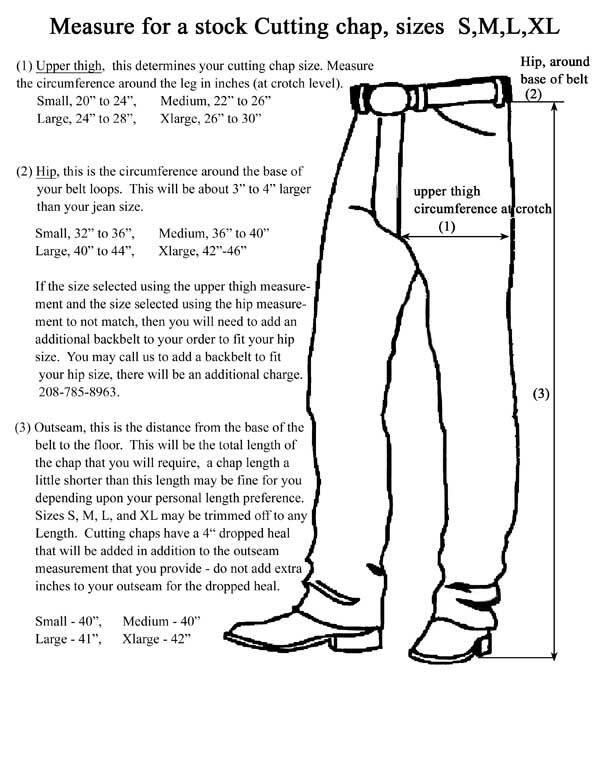 Finding your size: we have added a photo showing chap dimensions and a measuring chart to help you select the correct size. Please view the photos at the bottom of the page for this information. Please call us with any questions regarding the batwing chaps, measuring, or selecting the proper size. 208-785-8963. Leather options: These batwing chaps are made with what we call our "basic" leather which is available in "earthtone" colors. The in stock colors normally range from lighter to dark brown. We have added a photo below of some fairly typical earthtone colors. If you see a color you like, you can add the swatch number in the comment box when checking out. The leathers may come in oil tans, non oil tans, firmer temper, softer temper, heavier weight, lighter weight, and etc.. You will select these preferences below. If leather is an important issue to you, we can email a free digital photo of the batwings that are in-stock that will most closely match your description of color and preferences. We can normally do this within a few minutes so you don't need to wait long. 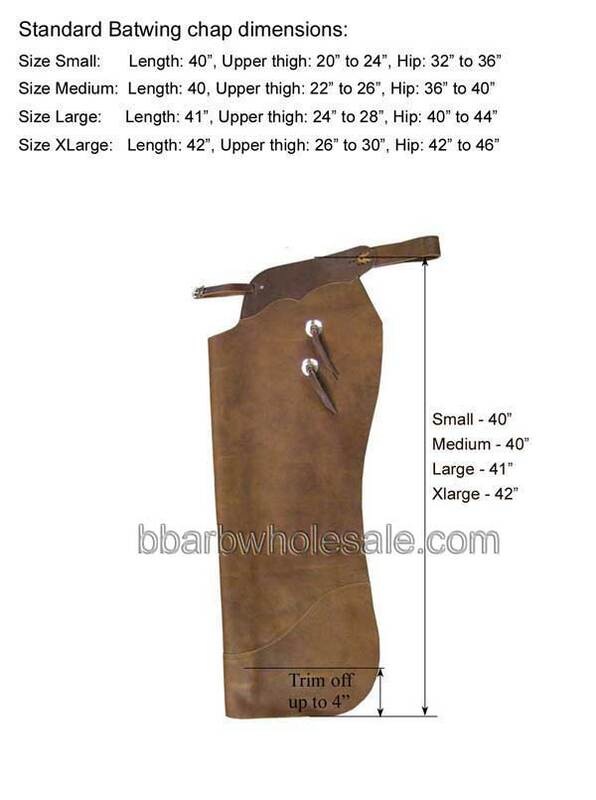 If we don't have the preferences that you want, you may need to special order your chaps with additional charges. Snap & dee leg closure available: You now have the option of snap and dee leg closures in place of the standard leg strap and buckle closures. You may select this option below. Option to Add a third leg strap: You also have the option to add an additional set of leg straps and buckles or an additional set of snap and dee closures to a stock batwing chap. This will provide a chap with three leg closures rather than the standard two leg closures. This is not recommended for shorter inseam lengths. If you choose to add the third leg strap the chap may not be returned. It will then be customized and will no longer be a stock item. Call us with your measurments before adding the third leg strap so we can be sure you are getting the correct size prior to modification. 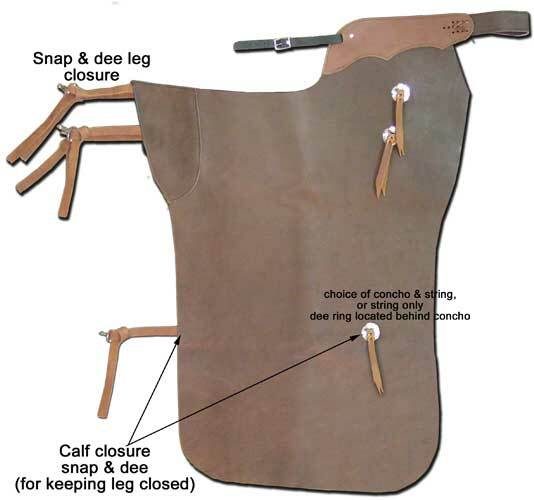 Calf Closure option: You may also add the "calf closure" option to keep the lower batwing leg in a closed position. If you decide to add the calf closure option, you need to be certain that your measurements are correct because the calf closure is a custom item. These cannot be sold as a normal batwing chap once the calf closure is added. 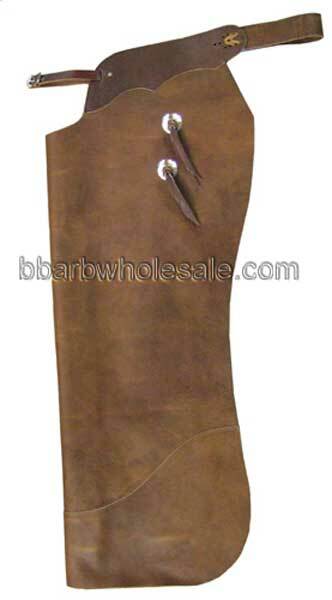 Therefore, once the calf closure is added, the item has been customized and is not returnable. Please phone us to go over your measurements prior to ordering a calf closure so that we can be certain you are ordering the correct size. We will also want to know the specific location at which you want the calf closure to be added. We can also determine this after we discuss on the phone. a photo of the calf closure is shown in the photos at the bottom of the page.